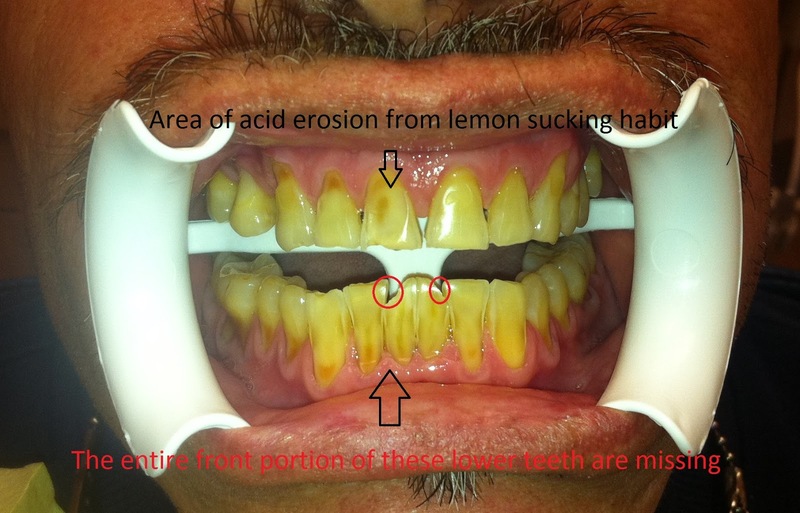 This central American habit can lead to massive erosion of tooth enamel and dentin. Below is a picture of the worst case that I have ever seen. Unfortunately, the body compensates for the loss of eroded tooth structure by erupting the teeth further into the mouth and keeping them in contact with the opposing teeth. This makes it expensive and time consuming to restore these teeth properly (examples here). Enamel will start to dissolve at a pH of about 5.5 (1). The lower the pH the faster the erosion will occur (2). Lemon juice has a pH of about 2 and at that pH it does not take long for damage to really start adding up. Listed below are some pH levels for reference.